This afternoon, during a presentation made by the captain aboard the Norwegian Epic, he revealed news that literally knocked us for a loop. After he'd revealed earlier that the waves at sea were 50 feet, not the original 30 feet, he said it the roughest seas he's experienced with this ship but was impressed it handled it so well. If you've seen the photos that I posted about the "looks" of this ship, it appears top heavy. Oh, my! He expressed the reason that he "told us" that the waves were 30 foot swells as opposed to the actual 50 foot waves was to avoid panic by the passengers and crew. There's a special station on our cabin TVs, whereby the ship's navigational stats are updated by the bridge in real time. He'd made a conscious decision not to post the actual statistics as the waves escalated instead sticking with the stats of 65 miles per hour winds and 30 foot waves. In addition, he didn't reveal that he intentionally shifted the ballast, gradually increasing it up to 6 degrees, resulting in the ship listing to one side to counteract the waves as they slammed against the ship. He made the right decision in not revealing these horrible stats. Many passengers would have been extremely distressed with this information. Tom, of course. says he would've been fine but agrees that the captain did the right thing. On this particular ship, the lifeboats are extended beyond the superstructure on the ship. 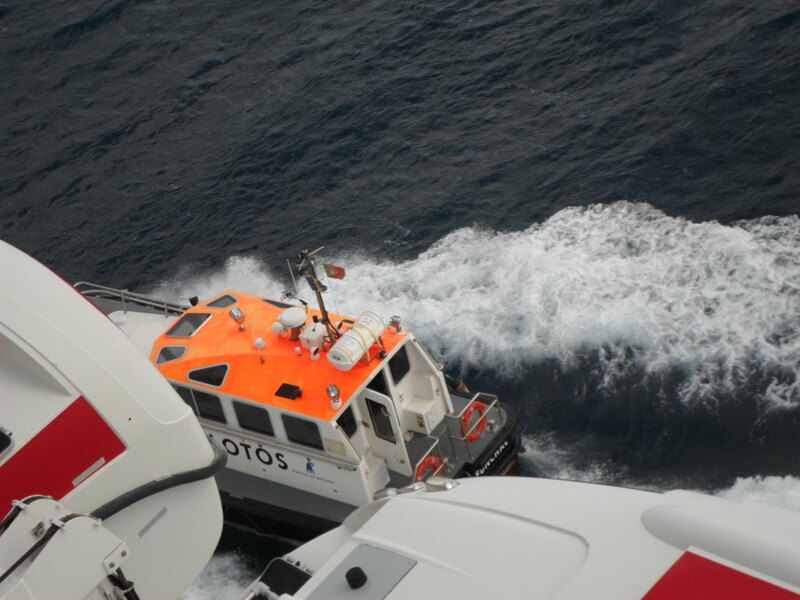 As the 50 foot waves smashed against the ship, the lifeboats were in danger of damage and flooding. By listing the ship to one side in the direction of the waves, the risk of damage was diminished. The maximum such shifting a ship of this size can withstand in 7 degrees. It's no wonder we had trouble walking in the hallways, and even in our cabin, as we leaned to one side. I told Tom it reminded me of a "fun house" type room that they had at Knott's Berry Farm, when I was a kid...when one stepped into this particular room, it was impossible to stand up straight. That was us, aboard the Norwegian Epic only, tilted to one side, bashing around on unsure footing, empty barf bags all over ready to be used. Some passengers didn't leave their cabins for three full days, too sick to get out of bed. I must admit I didn't work out during that period but we did go about our days, not missing a meal, attending available evening entertainment (some shows were cancelled) and daytime seminars with few in attendance. At least we've hopefully experienced the worst seas we will experience cruising. Anything less will be quite tolerable. Whew! Barcelona, we're on our way! Last night's "towel pet," an adorable bunny. WiFi too slow to add more photos today. Staying awake until 3:30 am another night, partly from the excitement from sailing through the Strait of Gibraltar and the remainder from our seven hour time difference. We can't seem to shake this time difference, no matter how hard we try. Continuing to go further and further east on our trip to Dubai, the difference will only become more pronounced. Prior to this cruise, we'd assumed that adding time slowly, as we crossed the ocean would make the time changes less obvious. How wrong we were! We now realize that a fast time change one experiences when flying makes adjustment easier when one is in control of their waking, eating and sleeping. On a ship, time is scheduled, leaving us feeling as if we must try to stay in sync with the ship's time in order to get into the restaurants and events on time. There are a few dining spots open 24 hours but they serve fried foods, burgers and pizza, none of which meets my dietary criteria. Last night, left us in awe in a similar manner as when we traveled through the Panama Canal. When we entered the area Tom commented that it would have been especially enjoyable to see the Strait (I've since learned it's "strait" not "straits", my error) during the day. Much to our surprise, the nighttime crossing was breathtaking with a twinkling light show, varying in size and color as we passed by Morocco and then finally to the Strait of Gibraltar. At the moment, as we sit in our favorite booth in the Garden Cafe, we can see the shores of Cartagena, Spain. Tomorrow, morning we'll arrive in Barcelona where we'll spend the day exploring and taking photos. Later in the day we'll return to this ship, the Norwegian Epic, for the four remaining days of our back-to-back cruise. With five and a half hours sleep, I'm feeling a little more rested today. Missing five days without working out after the three days of rough seas plus sheer exhaustion, today I'll force myself to get to the health club. We're losing our tans but hopefully I can maintain my level of fitness, vital to our continuing travels. By the way, I've yet to take the time to open the box with the new camera, charge it and learn to use it. Over the next few days, while out to sea, I plan to get it taken care of. There will be some serious shooting as we begin the 15 day journey to the Middle East. Perhaps, committing this to writing, will force me to follow through. Look for us late afternoon tomorrow, with photos of Barcelona when we return to the ship for the remaining four days of this cruise. Turning off all the lights in our cabin, we're enthralled as our ship sails through the 13 miles wide channel of the Strait of Gibraltar with Casablanca, Morocco on the starboard side and the Rock of Gibraltar to the port side. Bright lights are flickering on the African continent as our hearts beats wildly with excitement knowing that on March 1, 2014, a mere 10 months away we'll be living in Morocco for almost three months after similar periods after living in Kenya and South Africa. We wish we could take photos but the shore is too far away to get a decent shot at night. Tomorrow, we'll write again with updates as we sail to Barcelona. Hopefully, soon, we'll temper our enthusiasm and get some sleep. In Belize right now, it would have been 3:15 pm. I can't imagine falling asleep soon! Traveling styles...where do we fit in? 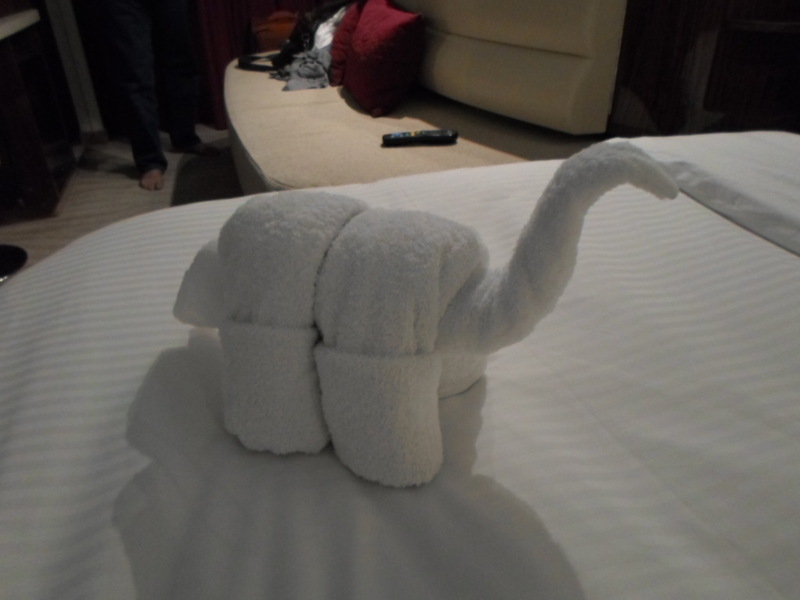 "Dino," our towel pet last night. Time changes continue. At our present location, 12 hours from entering the Straits of Gibralter we are 9 hours later than Los Angeles and 7 hours later than Minnesota. Last night during the night, we hit rough seas again, not as bad as a few days ago, the three torturous days of 50 foot swells. Sleeping still seems to be an issue for us but also other passengers revealed that they too, continue to be unable to go to sleep until 2:00 or 3:00 am, awakening at 9:00 or 10:00. It's the nature of the beast. Yesterday, after only four hours of sleep we awaken early. Sluggish all day, I'd hope an early night would be in order. After dinner and a live show last night (comedian/magician) we returned to our cabin at 10:45 pm to find yet another card on the bed informing us to forward our clocks another hour. Suddenly, it's almost midnight with nary a desire to sleep. By 2:00 am Tom dozed off. At 3:30 am, I did as well. We awoke at 9:00 am, still tired, struggling to get up and ready for the day. During the night I was up several times with a funny stomach, not "haha" funny but "oh oh" funny. Never one to suffer with abdominal distress, immediately my mind went to either food poisoning or norovirus. My fish tasted funny last night at dinner, not "haha" funny but "oh oh" funny. With an absence of other distress or nausea, I've dismissed it as a fluke, refraining from eating anything yet today. We'll see how it goes. Still reeling from the joyful experience yesterday of meeting Gina, the owner of the house we'll rent in Madeira Portugal next year and having an opportunity to tour of portion of the tiny island of Madeira. Pilot boat picking up the pilot that had come aboard as we approached the pier to aid in maneuvering the ship to the dock, which we've observed as we enter each port of call. Today, we're content to spend a lazy day, reading our books and perhaps watching a movie on the giant screen in the Atrium, the main lobby area of the ship. Every three or four days, I consume a novel, many of which either free or under $5 on Amazon.com, mostly books popular a few years ago with four and five star reviews. Mostly some simple stories, some more significant. ﻿Tom, a slower reader has been wrapped up in many books written by Vince Flynn, a Minnesota author who's series of well-written novels center around CIA stories of international intrigue, an ongoing saga of a character, Mitch Rapp. So far, he's read five lengthy novels with many more to go. ﻿Most of our reading occurs at night in bed with only an hour or less during the day. With no US TV shows other than a few news networks, we seldom watch anything. Occasionally, a 10-15 year old movie runs, many about baseball. We've seen "Field of Dreams" three times and "The Natural" four times, mostly in bits and pieces since there's no way to know in advance when a movie is on. 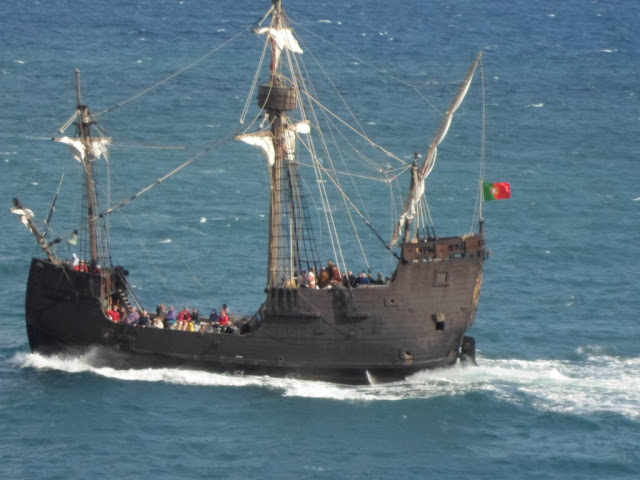 "Pirate" type boat for tourists, observed while still in the Port of Madeira. Last night, we dined in the "included" Manhattan Room, the food again mediocre but made memorable by the four women at our shared table, many experienced travelers, two coincidentally from Minnesota. 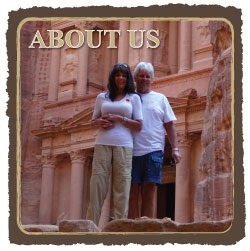 Its enriching to hear the suggestions by other travelers with much more experience than us. We've observed how each traveler has their own specific style of traveling. Our human nature is to believe that "our" methods are the best. We are no exception although we're curious about the methods of others. Many factors determine the style travelers we all choose to be: financial constraints or desires, time constraints, need or desire for comfort, personal interests, personality and lifestyle. Pier as we pull away from Madeira. A ship, the MSC Sinfonia remains at the pier. We find many travelers content to backpack, stay in hostels and sleep in tents if need be. Others are in the middle, as we are, desiring comfort while willing to pay a little more for it. Others will only travel staying in the most plush cabins, finest hotels and dining in the most posh restaurants. Whichever style the travelers we meet choose, we find them interesting, often picking up a tidbit of information that we may find useful in the future. On we go, to the port of Barcelona in two days while we continue on our second leg of this back-to-back cruise for four more days to Majorca and Marseilles. We'll have get off to go through customs but able to keep our stuff in our cabin. Goodbye, Madeira. See you again next year. On May 5th, we'll be back in Barcelona for our next leg of our journey, the 15 day cruise through the Suez Canal to the Middle East. Some say we're crazy to explore this highly charged area of the world while we feel excited for the opportunity. We plan to explore Barcelona, sharing photos and stories of how we'll avoid the rampant pickpockets, for which Barcelona is so well known. Obrigada, Gina, for a memorable day! Seeing next year's vacation home! What a pleasure! 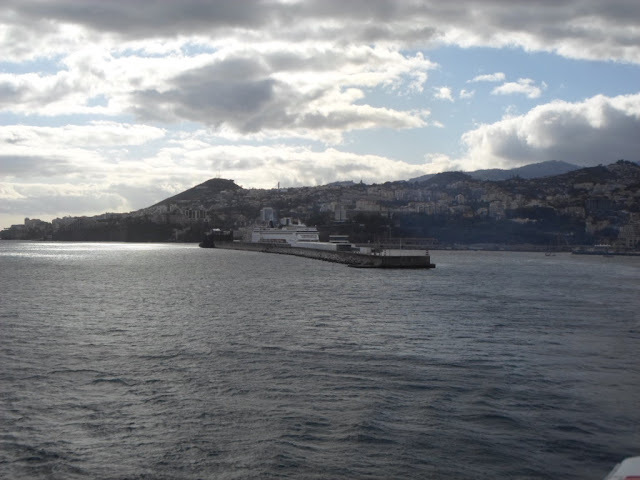 View from the Garden Café this morning as we waited to disembark in Madeira, Portugal. drinking coffee and enjoying the view of the sea from almost every room. Another view of the wraparound veranda. The drive as we left the house in the Riberia Brava area. We entered one narrow tunnel after another on our drive around the island. Today, reminded us why we chose to travel the world. Enmeshed in another culture while driving through the winding mountainous roads of the quaint villages of Madeira with expansive views of the ocean around us, we felt enriched and in awe. Gina, owner of the home we're renting next year was excited to show us the house. The 20 minute drive on the winding mountainous road was breathtaking. The winding barely traveled road by the house was easy to navigate. her fathers tends to each day. He'll also deliver free range chickens to our door. Our future home for almost three months beginning May 15, 2014, we looked at this port of call with different eyes than one would look on a excursion from the ship. Another view of the garden from our future home. Comfortable living room with leather sofa, WiFi, TV with some US stations, sound system and extraordinary view will make us feel right at home. Cozy working fireplace in living room. Unlikely, that we'll use it during the spring and warm summer. Gina, owner of our future home, albeit short term, met us promptly at the pier welcoming us in broken English with universal hugs while giddy with enthusiasm. Warmth and charm exuded from Gina in a manner that captured our hearts as we all chatted on endlessly while listening intently to decipher the meaning of her words. The well appointed kitchen had everything we need including a bottle of fine red wine Gina will save for us. The kitchen was well equipped with dinnerware, pots and pans, serving pieces, wine and beverage glasses along with many utensils. Gina lives across the street and offered to bring us anything else we may need. Of course, we'll invite she and her husband Carlos for dinner. Carlos speaks no English but perhaps by then, we'll speak a little Portuguese. Nook area off the dining room. Somehow, we managed to communicate well enough to enjoy the hours we spent together in and out of her Citroen, touring the 35 mile long island, crossing its many bridges, traveling through its multiple narrow tunnels, all the while reveling in the unique design of its homes and buildings, entrenched in rich history and tradition. Didn't see too many of these in the US although quite common in other countries. The home has three full bathrooms. Perhaps, I will select one exclusively for me, the one with the Jacuzzi! With three bedrooms, either of two could be the master with two en suite bathrooms as well as a third guest bathroom. All areas are modern and well equipped. As we maneuvered through the narrow winding roads on a 20 minutes drive, Gina took us to see "your house" as she frequently referred to the awe inspiring home we'll be renting next year. Third bedroom with king bed, private veranda and Jacuzzi bath. Pulling into the tiny driveway, she steered us to the wooden front door to reveal the home exactly as it had been pictured on the rental website, that in person, illustrated a warmth commensurate with her charming demeanor. Intriguing stairway to second level. was less desirable with cloudy and rainy weather. The colorful narrow roads held one interesting view after another. We'll never tire of the quaint neighborhoods. An outdoor restaurant in Funchal, known for its fresh local seafood was recommended by Gina. We walked along the boardwalk in the town of Capanario, near "our house"
More narrow road lined with upscale homes on the road to Funchal. of the road. There were many round-abouts, tunnels and bridges throughout the island. The road as we neared the Port of Funchal. Our future home. Perfect for us. I wanted to move in today but we cheerfully tucked it away for yet a year to come with so much to anticipate in the interim; a cruise to Dubai including a 13 night stay, a Mediterranean cruise, two to three month stays in homes in Tuscany, Kenya, South Africa and Morocco, all before we return to Madeira. Colorful buses and tourist vehicles busily moved through traffic. ﻿Ah, please pinch me. Tom, on the other hand, easily settles into the reality of our lives on the move, while I engage in child-like wonder at the prospect of it all. Together, we make a good pair of world travelers, filling in the blanks for one another while tempering the excitement to a manageable level. View of our awaiting ship, the Norwegian Epic. Yes, obrigada, Madiera, for welcoming us to your little piece of the world. Next year, we'll share our stories with our loyal readers from all over the world. Obrigada, dear readers, for sharing this journey with us. Back to our current home, the Norwegian Epic, for seven more nights. Then, one night in a hotel in Barcelona. Then on Royal Caribbean's Marinerof the Seas to Dubai, United Arab Emirates. to clear and warm up. This morning at 9:00 am our ship, the Norwegian Epic, entered the port of Funchal, Madeira, Portugal, situated 350 miles from the coast of Morocco (where we'll be living one year from now) offering us one of the most breathtaking views of our lives. Birds flutter around our ship, searching for a meal as the thrusters stir up the ocean floor, bringing fresh schools of fish to the surface. The vistas of this mountainous island with peaks at high at 6100 feet is a mere 35 miles long and 13 miles wide. The hillside is liberally ensconced in one architecturally interesting white building after another. 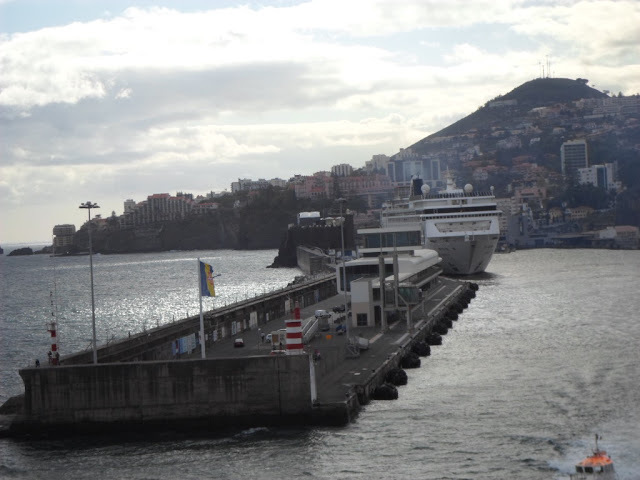 As the ship, the Norwegian Epic, approached the pier in Funchal, Madeira. On May 15, 2014, we'll return to Madeira to a nearby coastal village, Ribiera Brava, where a magnificent home awaits us to enjoy until July 31, 2014, a full two and a half months. We'll be arriving to Madeira after spending nearly three months in Marrakesh, Morocco. At this point we haven't planned our mode of transportation for this short journey...preferably a ferry or ship but most likely by a air. Our bellies full of a good breakfast in the Garden Café, we currently are situated in our favorite booth look alike, to ensure our most advantageous views while we wait to disembark the ship to meet Gina, the owner of the house we're renting here next year, to give us a tour of the house and the island. We couldn't be more excited! What awaits us today is a similar feeling of adventure we felt upon entering Belize the months ago, almost to the day. Neophytes when we left the US only four months ago, we now have a little experience under our belts with mounting opinions and ideas as to our present and future as world travelers. It would have taken eight years of two week vacations to experience what we've done thus far in these four months. With five cruises behind us, we begin to get a "lay of the land" in cruising as well as the experience of living among the locals in a remote underdeveloped country. Our feet are "officially wet" with so much more awaiting us in the future, especially today as we explore this magnificent island. Our MiFi is working here allowing us to upload photos we'll take when with Gina today as we explore this tiny island and our future home. We'll be back later this afternoon with photos before the ship sails at 6:00 PM while our connection stay in tact. This morning, we awoke at 10:10 am, new time, after yet another time change during the night. By the time we showered and dressed and sauntered to the Garden Cafe it was after 11:00 am. We decided on lunch as opposed to breakfast requiring we only wait until 11:30 am when lunch is served at the buffet. Once again, our favorite booth was awaiting us while all booths around us were filled. In October 2014, we've booked this same ship back-to-back to return to the US to work our way toward Hawaii to be with our family at Christmas. At this point, we're considering canceling both cruises and booking another line for this long journey. As soon as we can use our MiFi, we'll be contacting our cruise guy Joaquin, at Vacations-to-Go, to make the changes. This far out, we won't be charged cancellation fees. Without a doubt, this is a beautiful ship mostly appealing to the older population, but with many amenities most passengers don't use: a rock climbing wall, giant slides, two bowling alleys and a wave pool. Also, there's the Ice Bar, with a temperature of 27 degrees requiring one to wear a coat provided (who wants to wear a coat someone else wore???) paying a $20 cover charge per person. We've yet to see anyone enter. Most passengers aboard this ship are from cold climates. Why would they want to sit in a freezing bar sipping a frozen drink, the only options available? When booking a cruise, all of these amenities are appealing. Once on board, we find little interest by us or others to partake of many of these "attractions." With lifeboats consuming all of the deck space, there is no deck on which to walk, read and relax. With our romantic expectation of lounging in a chaise, covered with a blanket, reading an enticing novel as we cross the ocean, we are sorely disappointed. Then, there's the food. Today, after a full week aboard the Norwegian Epic, we've come to a conclusion: the food aboard this ship is by far the least desirable we've had after cruising on three cruise (five cruises) lines: Celebrity, Carnival and now Norwegian since January 3, 2013. However, the overall service although good, leaves much to be desired in their communication with one another. When the same mundane tasteless plate of food is placed in front of me each night, I've become bored with eating: a salad, a piece of unseasoned fish, a plethora of bland steamed vegetables. Last night it was tilapia, the prior night a 3 oz steak and a few unseasoned small shrimp and the prior night, a small chunk of bland snapper riddled with bones. (A properly prepared snapper shouldn't have any bones). To avoid liability, they require that I order my meals the prior night, so the cooks can ensure the pan is free of corn oil, flours and sugar. I've asked for seasoning other than salt and pepper but have yet to have a bit of flavor in the food. Preordering is awkward with other guests at the table curious as to the special attention paid to me by a man dressed in formal attire waiting while I select something from the next night's menu. Inevitably, I'm asked by the rightfully curious table mates as to why I require this special diet leaving me no choice but to graciously explain. If I didn't explain, assumptions may be made that I'm a prima donna, on an Atkins diet trying to lose weight, inconveniencing the staff and the table while I rattle off all of my restrictions. Little do most know that I have to eat huge amounts of fat along with the foods I can have, to avoid losing weight. I don't want to lose weight. Is it any wonder that Tom lost 45 pounds following along with me? Neither of us can afford to have clothing that doesn't fit us! On the Celebrity Century, their regular menu included several exquisitely prepared gluten free options using natural juices, seasoned to perfection. The side dished were varied options, such as mashed garlic cauliflower or pureed carrot soufflé. Although the Carnival Liberty didn't have an exclusive GF menu, they provided me with some good options, varying the menu each night. Here on the Epic, most night, my order arrives with an item on the plate that contaminates the entire plate, requiring I send it back. Last night, while dining with two delightful world traveling couples, I sat there without a main course while the others were into their dessert. They'd brought gluten free bread (no GF flours allowed except nut flours) with the tilapia covered in a flour-like red sauce sitting atop a pile of white rice (no starch allowed for me). They knew this. There is a file under each passenger's cabin number that appears when they check into the restaurants each night. The kitchen, the chef and the servers receive a printout of what each passenger may and may not consume along with a list of what was pre-ordered for the night. Not rocket science. The conscientious assistant maitre d, Steven, seems equally frustrated that my food continually goes back to the kitchen to begin anew. He has carefully outlined my diet: any meat and sauce without sugar, flour or starch, steamed or olive oil sautéed non-starchy vegetables, cheese plate (no fruit, no bread, no crackers) for dessert. It's not that hard. Tom is equally frustrated, almost having had the same dinner and dessert night after night, bland and uninteresting. Presentation lacks originality and appears comparable to what an inexperienced cook would throw on a plate. Tonight, we're booked a reservation for dinner in the Moderno Restaurant, a Brazilian barbecue with a variety of seasoned meats, none with starch, sugar or flour coatings. Last night, we spoke to Clive, the Moderno chef and he assured us there won't be an item served by skewers that I won't be able to enjoy. The salad bar literally made me jump for joy with most options suitable for me. At $20 per person for this specialty restaurant, plus drinks and additional tips, most likely our bill for tonight won't exceed $65. Should we dine in specialty restaurants the remainder of this leg of the cruise, ending on May 1st, we'll still be well within our budget of $900 for the 11 day ocean crossing. Currently, our bill is around $575, $300 of which was for the Internet connection, the remainder for drinks and mandatory daily added tips of $12 each. We'll post the actual amount of our bill once this leg ends. The second leg of this back to back cruise is only four days for which we've budgeted an additional $400. Our Internet bill will be considerably less since we'll spend two of the four days in port, making it possible for us to use the MiFi to post our photos. Plus, in each case, we'll be getting off the ship to explore Majorca Spain and Marseilles France. Tomorrow, we'll be in port for the first time in eight days, spending the day in Madeira Portugal. As mentioned earlier, Gina, the owner of the house, we'll be renting from 5/15/2014 to 7/30/2014, is meeting us at the pier to show us the house and to tour the island. How exciting! Photos will follow tomorrow afternoon as soon as we return from our tour with Gina. With the MiFi working again, we won't have difficulty uploaded photos. So, please look for us tomorrow with photos and story of the island of Madeira, Portugal, 1200 miles off the coast of Lisbon, Portugal and our experience with Portuguese speaking Gina. We'll be posting more photos once we get to Madeira on the 28th. Internet too slow to upload photos. Its 11:30 PM. Clocks will change another hour forward at 2:00 am. With winds close to 65 mph and 30 foot waves, we're swaying from side to side in our cabin. The walls and ceilings are creaking so much that it sounds as if something is about to break apart. Many passengers are seasick. Ready-to-use barf bags are taped to the railings. No one can walk a straight line. Some of the entertainment has been shut down until further notice. Not a word from the bridge since this morning. The TV channel entitled "Word from the Bridge" gave us the above stats. Are we safe? I guess we are. How will we sleep with the rolling and the noise? I don't know. We're a two and a half days from our first port of call, the island of Madeira Portugal, off the coast of Algeria. We're more than halfway across the ocean. Its 2:00 AM. I actually slept for a few hours. We changed our clocks when we went to bed at midnight. I was dreaming about water running...lots of water running. The water sounds as if it's coming from outside the door. Tom is sound asleep. I want to awaken him but I don't. I want to open the door and look outside in the hallway. I try to open it. It won't open. The heavy self closing door requires a hefty pull using my right arm. I haven't been able to open it once since we boarded six days ago due to my bad right shoulder. Why would I think I could open it now? I jiggle the lock but can't tell, in my harried state, which way is open. Give up opening the door, my head screams. The swaying and creaking are louder than ever. I need to look outside. Repeatedly faltering as I maneuver to the sliding door, I fall toward the glass grabbing the thick drapes to keep me from going down. Pulling the drapes to the side, in the dark I can see the huge white caps, the 30 foot waves, grasping at the ship in an angry rage, as if to attack. There's nothing I can do. I'm a little scared but I must be brave. I crawl back into bed, pulling the covers over my head. Sleep, please come. Thirty minutes pass. I take the Tylenol PM I'd left on the shelf next to my side of the bed, just in case. Swallowing it down with leftover iced tea in my mug, it feels stuck in my throat. I drink again and position myself on my left side, as always, protecting the bad shoulder with a pillow under my elbow. The noise is deafening, the creaking, the sound of running water, the roar of the sea. Finally, I drift off, desperate to escape my own thoughts. Its 8:52 AM. Sun is filtering into the cabin through a tiny sliver I left open during the night in the thick red drapes. The sound of the cabin creaking are a soft murmur. The sound of water running is no more. The cabin is rolling gently, a smooth roll, almost comforting as rocking a child in a cradle. I made a huge mistake before going to bed. I hooked up the Internet on my laptop at $.40 a minute, researching high winds and waves on cruise ships. The results were ominous. Over the past 30 years, people died, ships broke apart, ships sunk. Not much was written about the ships that "weathered the storms" other than a few comments passengers posted about their terrifying experiences, ultimately surviving without incident. Why didn't I glum onto those comments as opposed to the dreadful news? My old fearful self, crept her way back into my psyche in my exhausted state. Shoo away, old self! New brave self, emerge! In a way I guess she did, when she gave up and went to sleep. Old self would never have taken the Tylenol PM and gone back to sleep. She needed to stay in control by staying awake. How can one possibly stay in control and "piloting the ship" or "fly the plane" when one is asleep? I've never slept on a plane. If I slept, it all would fall apart, wouldn't it? I guess not. It's 11:10 AM. Now as I sit with Tom, still oblivious of the scary night, in our favorite booth in the Garden Cafe, the gentle rolling continues and I'm no longer afraid, not now and hopefully, not in the future. Last night I learned something, something simple. It's OK to sleep during the storm. This photo was last night when the swells were only 15 feet. Today they're 30 feet! ﻿﻿After a fitful night's sleep as a result of loud creaking in our cabin as the sea wafted from one giant swell to another, I gingerly crawled out of bed, exhausted and unsure on my feet on the rolling floor. Cautiously entering the shower, I gripped the well-placed grab bar hanging on for dear life. Not only did I drop the soap three times but my Venus razor hit the floor twice dislodging the shaver head. Usually, when I shave my legs each day, I stand on one leg while bracing the other leg to be shaved on the shower wall. Not today. I shaved half of each leg, the front, the part most likely noticeable. Hell, who's looking how close I shaved my legs? Tom would notice only if it became braid-worthy. We'd left the drapes open last night in hopes of getting up early to begin to reset our disrupted biological clocks. Lot of good that did when I didn't sleep more than three or four hours. Tom slept through it all. He says that for the first 12 of his 42 years on the railroad, he'd stand atop of the roofs of the boxcars, jumping from car to car as the boxcars were rolling down the track. That's how he earned his sea legs. Thirty years ago that dangerous practice was stopped. The most balancing I've done had been skiing years ago with my kids and simply walking on my two clumsy legs on ice and in snow for the past 42 years that I'd lived in Minnesota, falling at least once a year. As the waves have escalated over the past few days we've wondered how seasickness has escaped us as many passengers swarm the medical clinic located on our floor, the 10th. We've yet to use the patches our doc in Minnesota prescribed before we left. Why not us? I don't know. This morning as we wobbled along the narrow halls to breakfast, we noticed the common areas, the hallways and the Garden Cafe, our favorite breakfast spot, were sparse compared to the calmer days when we first sailed last Saturday, April 20th. As I slid over to the beverage area for our usual routine of me getting the coffee with Tom getting the omelets, the ship lurched and the hot coffee, fresh out of the machine poured all over my wrist and the long sleeve of my shirt. As I write this now, I am using an ice pack I've made on which to place my left wrist, from front and back, while I type single handedly with my right. No blisters yet, just raised and red. Later, when we return to the cabin, I'll dig out our trusty medical kit to put on some antibiotic cream and wrap a sterile bandage. See, I am clumsy. As we sit in our favorite booth which opened up shortly after we arrived awhile ago, only moments ago we heard plates, glasses and flatware falling to the floor in the kitchen behind us with a loud, "Ooohhhh," from the crowd who grabbed the items on their tables to keep them from falling off. A few moment ago, the captain's voice came over the loud speaker and this time, everyone hushed and listened. "Ladies and gentlemen, this is the "Old Man" (as he refers to himself, "old man of the sea"). "We are experiencing 30 (he later told us they were 50 foot waves) foot waves and I appreciate that you are uncomfortable. We are attempting to veer our course but it looks as if this may continue until after dark tonight. There is nothing to fear." Another shot of a mere huge swells. Fearful, are we? No. We'd anticipated that crossing the ocean would be rough. We're in awe of how our ancestors crossed the sea on ships without stabilizers, navigational equipment, weather reports, doctor clinics and a wide array of safety and emergency equipment. How did they do it? Many ships didn't make it. A few days ago, we made it through the Bermuda Triangle without incident. Safely passed, we were inspired to attend a seminar yesterday about "the Bermuda Triangle, Fact or Fiction" albeit while the ship was rocking and rolling to 15 foot swells, now at 30 feet. We learned, as we'd suspected, that many of the stories as to its dangers, were either coincidence or not unlike lost ships and planes in other areas of the sea. Now five hours ahead of the time in Belize, a mere 16 days ago, we have yet to adjust to an upcoming three additional hours. For now, that is a moot point, as we watch the waves engulf the balconies on the first several decks of the ship. Taking good photos is nearly impossible, let alone walking to the 25 feet to get a vantage point at the window. Our monkey towel pet awaiting us last night when we returned after dinner, along with a note on yet another time change. Tom tried to get some photos today but its impossible to stand still long enough to get a good shot. We'll report back. Stay tuned. Thumping is over...we moved to a new cabin!